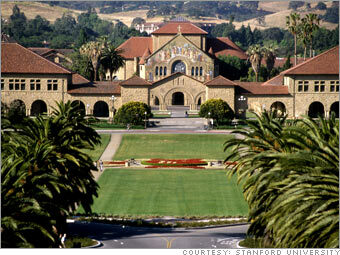 Why we chose it: With its extensive network of Silicon Valley contacts and successful integration of entrepreneurship into its engineering program, Stanford wins rave reviews from entrepreneurship professors nationwide. Even though it does not have a formal undergraduate curriculum on the subject, the school fosters entrepreneurship through organizations such as the Business Association of Stanford Engineering Students, which connects both undergrads and grad students across campus at networking and educational events. "We teach students the skills that help them take their ideas out of the lab and into the real world to make a global impact," says Tina Seelig, Executive Director of the Stanford Technology Ventures Program. Entrepreneurship Week, launched this year at Stanford, featured a contest to create value out of a pad of Post-Its.